This study investigated options for major repairs or possible replacement of the Algonquin Island Bridge in order to ensure that a link between Algonquin and Ward’s Island is maintained and accessible for all users. Work on the Algonquin Island Bridge Rehabilitation remains ongoing. Due to the complexity of replacing the timber substructure of the bridge underwater, the rehabilitation work has been postponed by one year. Over the coming months, a revised design will be prepared that will address the unique challenges of replacing the substructure. The revised design will reduce the anticipated cost, the risk in the construction schedule, and the potential impacts to nearby utilities. Rehabilitation of the Algonquin Island Bridge is now scheduled to begin in October 2019 and be completed in March 2020. Construction on and around the bridge is limited to the period of October to March due to government restrictions in place to protect fisheries and wildlife habitat. 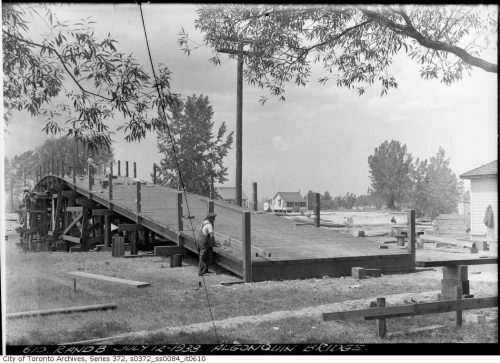 The Algonquin Island Bridge is inspected regularly to ensure continued safety. The City will schedule a public event to showcase the design options once they have been completed. In the meantime, ongoing project updates will be posted to the project website. We appreciate your patience as this project moves forward. 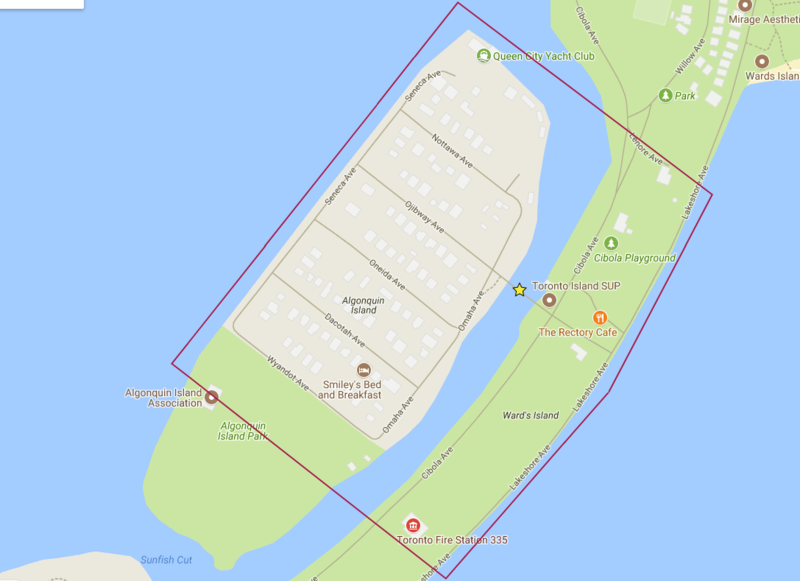 As part of the Algonquin Island Bridge Rehabilitation, site testing to locate gas mains will take place on land next to the bridge. The site work involves digging four test pits to determine the exact location of the gas mains. Testing is done so the design and planned work will not affect the existing gas mains. Site testing will begin on March 19, 2018 and could take between 1 and 4 days to complete. View the site testing notice. If you require assistance reading this notice, please contact Andrew Plunkett, Sr. Public Consultation Coordinator at Andrew.Plunkett@toronto.ca or 416-397-1968. In response to new information that has recently become available, the City is changing its approach to addressing the deteriorating condition of the Algonquin Island Bridge. The 2014 Algonquin Island Bridge Municipal Class Environmental Assessment (EA) recommended replacing the existing bridge. However, a detailed condition assessment was conducted in June 2016 which identified an opportunity to rehabilitate the existing bridge instead of building a new bridge. The condition assessment identified that the life of the bridge can be extended by 30 years at a fraction of the estimated $6.0 million cost to replace the bridge. Rehabilitation of the bridge could commence as early as January 2018 and would take one year to complete. Alternatively, replacement of the bridge involves acquisition of rights to provincially-owned lands and construction of a temporary bridge, and cannot commence until summer of 2018 at the earliest with a construction period of over a year. After review and evaluation of this opportunity, City staff have determined that the reduced scope and cost warrant proceeding with rehabilitation instead of replacement. This rehabilitation work will cost $1.5 to 2 million. The bridge will remain open to pedestrians and traffic during rehabilitation work. During the EA process, area residents identified a number of key concerns with the bridge, including: lack of traction on the bridge surface; a handrail which is not easily accessible; and the grade of the bridge. Aside from the grade of the bridge, which is limited by the profile of adjacent roadways and property impacts, the key issues raised during the EA process can be addressed through rehabilitation. We want to hear from you about this change. Staff plan to meet with residents to review the details for rehabilitation. The Algonquin Island Bridge is the primary and only fixed access for pedestrians, bicycles and service vehicles between Algonquin Island and Ward’s Island on the Toronto Islands. Originally constructed in 1938, the structure was rehabilitated in 1998 with ongoing maintenance. The bridge supports a watermain along the west side and a gas pipeline underwater below the bridge deck. Currently there is a load restriction of 12 tonnes due to the aging structure and it does not meet City’s full service vehicle requirements. The bridge structure is in need of major repairs or possible replacement. This study has identified and evaluated options for rehabilitation or replacement which accommodate all users, both over and under the bridge, essential vehicles and the heritage value of the existing bridge structure. Built in 1938, the Algonquin Island Bridge is currently the sole link between Algonquin Island and Ward’s Island. The bridge is primarily used by pedestrians, cyclists and City of Toronto and other service vehicles. The bridge currently has a posted advisory load restriction of 12 tonnes. In 1992, the City of Toronto commissioned a limited bridge condition survey to determine the condition of the existing bridge structure. Based on the findings of this survey, the bridge was rehabilitated in 1998 and received a new deck. Recent bridge inspections have identified some decay in the timber piles and a need for additional repairs or possible replacement. Due to the age and historical significance of this structure, an Environmental Assessment was required to determine how best to address the condition and rehabilitation needs of this structure. 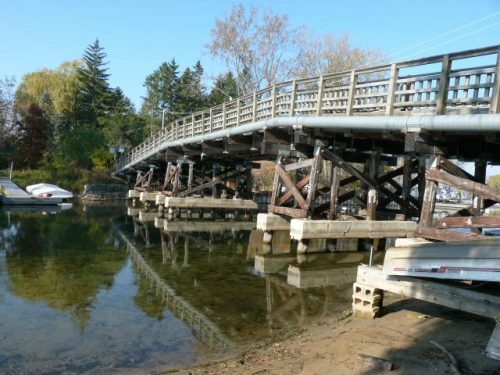 The Algonquin Island Bridge Environmental Assessment Study has been completed in accordance with the requirements under the Municipal Class Environmental Assessment (the Class EA). While the latest timber pile inspection has determined that some components would need to be replaced within the next year, this repair would address only the specific piles identified in the inspection as having experienced significant decay, and would not be nearly at the scale or cost of any of the rehabilitation options considered to date. The inspection report also recommends at minimum reassessing the condition of the remainder of the piles and caps within three years. This timing coincides roughly with the intended construction period for bridge replacement. The EA Study was carried out with the assistance of technical consultants and supported by a Technical Advisory Committee (TAC) with staff from Transportation Services; City Planning; Parks, Forestry & Recreation; and Engineering & Construction Services. Part of the Environmental Assessment consisted of a Cultural Heritage Resource Assessment. The study concluded that the location of the existing bridge holds historical significance and that a number of design elements should be preserved or recognized. Much of the original material, however, has been replaced over the years through regular maintenance and rehabilitation. Rehabilitate the Existing Bridge: This option considered the replacing approximately up to 80 percent of the timber components of the bridge, would cost up to approximately $4.3 million, and would require significant continuing maintenance. Build a New Trestle Bridge: This option considered the replacement of the bridge with a new structure of similar design, but built with modern materials including concrete. This option is also expected to cost approximately $4.3 million, and would last approximately 75 years, requiring limited regular maintenance. Minor Rehabilitation: would repair the deteriorated timber components of the bridge, costing approximately 1.25 million and would extend the life of the bridge by 8-10 years. Moderate Rehabilitation: would replace approximately 60% of the timber components of the bridge costing approximately $2.8 million and would extend the life of the bridge by 15-20 years. Major Rehabilitation: would replace approximately 80% of the timber components of the bridge costing approximately $4.0 million and would extend the life of the bridge by 15-20 years. Build New Timber-Concrete Composite Trestle Bridge: would build a new structure along the existing alignment incorporating a timber-concrete deck and a timber railing system costing approximately $4.3 million and in accordance with the Canadian Highway Bridge Design Code would have a life span of 75 years. These alternative designs have been compared based on total lifecycle costs, potential to address immediate community concerns with the existing design, and public feedback received. It should be noted that the existing load restriction would remain under the Minor Rehabilitation design, although a non-slip coating would be applied to the existing timber deck surface and drainage would be improved under this option. The Major Rehabilitation would reduce the grade of the approach span, and would accommodate heavy vehicles (as would the Moderate Rehabilitation). To view complete report, list of figures, tables and appendices contact Andrew.Plunkett@toronto.ca.